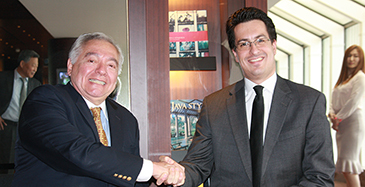 Peruvian Ambassador to South Korea Daúl Matute Mejía (left) shakes hands with Mr. Cesar Penaranda, investor servicing director of "ProInversion" prior to the interview with The Seoul Times at Grand Hyatt Seoul on May 15 2018. "We would like to invite South Korean businessmen and we want them to continue to invest in Peru," said a visiting high-profile Peruvian official in an interview with The Seoul Times on May 15, 2018. Mr. Cesar Penaranda, investor servicing director of "ProInversion" or Private Investment Promotion Agency, emphasized Peru's strategic partnership with South Korea. Director Penaranda arrived in Seoul in the morning of the day from Tokyo where he held "Road Show 2018 in Tokyo" to draw the Japan's private sector investment in the Latin American country. At the interview held at Grand Hyatt Seoul Director Penaranda maintained that thus far Peru has secured a private investment of 4,200 million US dollars in Peru, saying "We want to try even harder to triple the amount." "Our objective is to increase the platform for potential South Korean investors for Peru," stressed the Peruvian Ambassador to South Korea Daúl Matute Mejía who took part in the interview. He attended the "The Road Show Seoul 2018" to be held at Grand Hyatt Seoul on May 16, a part of his "Asia Road Show 2018 which include Tokyo, Seoul, and Beijing. He said that he will leave Seoul for Beijing on May 17, 2018 to attend his "Road Show Beijing 2018." Mr. Song Young-Wan, vice chairman of International Contractors Association of Korea (ICAK) made an opening speech along with other key figures. In his speech Mr. Song emphasized the importance of the close cooperation between Peru and Korea in the construction filed. "Our role for the Seoul Road Show is to promote the private investment particularly PPP (public private partnership) projects," said Director Penaranda. He said that there will be some 100 South Korean entrepreneurs, the potential private investors, at "The Road Show Seoul 2018" seminar. He said that the private investment in Peru represents 80 percent of the total investment, arguing that the private sectors for the investment is vital for Peru to have a dynamic growth in the future. Asked about why South Korea is important to Peru, the director said that as the same APEC (Asia-Pacific Economic Cooperation) countries South Korea's advanced technology is to improve Peru's infrastructure including water supply, sanitation, and energy. "We are like brothers who need very close cooperations," said the director. "We are very open economy and the benefits of the potential Korean investors are very attractive"
He also said that South Korean construction companies are also important to help develop the booming construction business in Peru. He said that Peru's economy started growing very fast some 20 years ago. "We need South Korean companies to develop our infrastructure including roads and airports," said the director. "We need 160 billion US dollars until 2025 to build up the infrastructure"
Meanwhile, the Peruvian envoy stressed the ties between Peru and South Korea in the academic areas as well. "There are over 100 Peruvian students in colleges and universities in South Korea," said the envoy. "They are doing MBAs and PhDs thanks to the assistance of KOICA (Korea International Cooperation Agency)"
After gaining his BA degree in Economics from the University of Lima Mr. César Peñaranda earned his MA degree in Economics from New York University (NYU). He also studied Finance, Economics, and Mathematics at Harvard University as a Fulbright scholar.